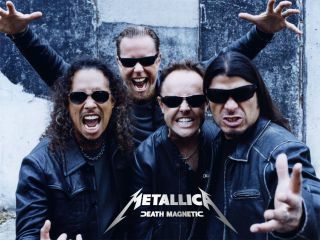 Friday 12 September 2008 sees the launch of Metallica's ninth studio album, Death Magnetic. Produced by Rick Rubin (as opposed to a psychotherapist…), it promises to be a killer return to form and their best since 1991's 'Black Album'. Hell, it doesn't "promise to be" - it is. We know. We've heard it. To celebrate, this week on MusicRadar is Metallica Week. Up until now, we've teased you with streaming songs and videos from the album but now we're going into absolute overdrive. But from today, you can expect archive band interviews, classic video clips, exclusive gear guides, metal production tips, blogs, fan polls… The bloody lot! We'll also be running a competition to win the über-cool Coffin Box edition of Death Magnetic, complete with an additional demos disc, a 'making of' DVD, an exclusive T-shirt, guitar picks, a flag, a fold-out poster, plus a "collectors credit card" embossed with a code that links to a download of "a special European show happening in September."